About a quarter of women 45 to 64 years old and one in seven of those 35 to 44 are caring for an older relative. Why did women’s rush into the work force stop? Policymakers have been vexed by the question for years. Social scientists have discussed the sudden stop for over a decade, in conferences and academic papers. Almost 12 years ago, I gave the topic a shot in the pages of The Times: why, after a five-decade rise, did the labor-force participation of women in the prime working years stall around the turn of the century? After years of sometimes scorching debates, over whether highly educated women were “opting out”; whether the stop was merely temporary; and whether it responded to gender roles at home or labor-market conditions, the analysis seems to have converged on a sort of rough consensus: caring for children — overwhelmingly a woman’s task — ultimately took its toll. Today almost 15 percent of the American population has reached the official retirement age, according to figures from the United Nations. That is about two percentage points higher than at its previous peak in 1995, just a few years before the labor supply of women in the prime working years — 25 to 54 years old — reached a plateau. It means that for every four Americans of working age, there is one of retirement age, the World Bank says. Lots of these older Americans — 14 million, according to Paul Osterman of the Massachusetts Institute of Technology’s Sloan School of Management — can’t live independently and care for themselves. The burden of care weighs predominantly on their wives and the daughters. 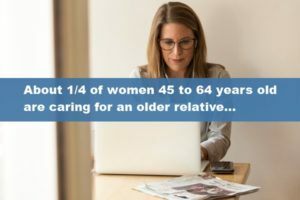 About a quarter of women 45 to 64 years old and one in seven of those 35 to 44 are caring for an older relative, according to the American Time Use Survey. It takes a toll. Ten percent of caregivers have to cut back on their hours at work; 6 percent leave their jobs entirely, according to a report last year by the National Association of Insurance Commissioners. After rising for half a century, the labor force participation rate among prime-age women began to decline in the early 2000s — around the time the elderly share of the population began to rise sharply. Part of the explanation for women’s declining share of the work force may be that women have generally had to assume most of the responsibility for caregiving to the elderly. The stress is getting no lighter. By 2030, more than one in five Americans will have reached retirement age. That will call for a lot of caregiving. One study found that retired members of the baby boom generation will need, on average, three years of long-term care. One in five will need more than five years of care. These pressures may draw more men to take responsibility for care. So far, though, experience suggests the burden will fall mainly on women. Unlike the boomers now taking care of their parents, their millennial children will not have as many siblings to help care for their parents. Higher divorce rates imply that many aging boomers will have no spouse to care for them, putting additional demands on their children. And the elderly of the future are going to live longer, which suggests there will be a lot of caregivers well into their 50s juggling work with care for their children and their parents. Much has been made of the fast growth of the caring occupations. The Department of Labor projects that the economy will add roughly 1.2 million home health aides and personal-care aides over the next decade. One critical challenge is how to turn these minimum-wage, direct-care jobs with few skills into higher-quality and better-paid employment that can attract the millions of new workers who will be in demand. But there is a broader societal challenge: how to fit a social safety net built in the 1930s, when wives stayed at home and life expectancy was 20 years shorter, into a world in which husbands and wives must juggle work with the demand for care from their elders and their children. It is probably naïve to harbor these thoughts just as Republicans in Congress and the White House are engineering a tax cut for corporations and wealthy Americans that will reduce government revenue by $1 trillion over a decade. It may sound crazy to say this just as Republican leaders are turning their sights on the next step of the strategy: cutting spending on programs like Medicaid and Medicare to pay for the tax effort. But perhaps this is time to beef up the safety net to incorporate the rising demand for care. In his book “Who Will Care for Us?,” published this year, Professor Osterman estimates that there are about 21 million family members caring for an adult relative for no pay. By 2040, he predicts demand for such care will rise to 34 million. And if prime-age women start leaving the work force in even higher numbers to care for their aging parents, this will also be a problem for the American economy. Perhaps it is time for you to investigate Long-Term Care insurance. Let experts guide you through the process, not your car insurance agent or financial planner who dabbles in it occasionally. Check us out online at www.TheLongTermCareGuy.com and then call The Long Term Care Guy at (920) 884 3030 to schedule a time to investigate solutions.